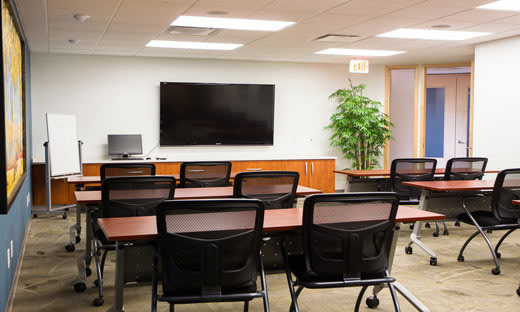 Our classroom and lab/clinic are available for educational use by outside groups. The room seats approximately 21 classroom style or 36 with chairs only. Display is an 80" flat screen monitor with a dedicated workstation, and inputs for PC or Mac laptops. We also have a LCD projector and 8'x8' screen available for use. The kitchen area is accessible from the rear so catering staff can come and go without disturbing course participants.